I’m really worried that too many young people will look at the superficial Obama, the well-spoken man who promises much, and yet fail to understand that taxing and creating a larger central government are not ways to improve the economy. If Obama does win, I’ll at least be fortunate enough to be earning a small salary as a resident for his single four-year term and, therefore, not have to distribute as much of my hard work to the large number of Americans that contribute little but expect the government to provide everything for them. One can only hope that he is promising this redistribution only to get elected and then back down to a moderate view. Unfortunately, that may not be the case and it may take four years for the American people to realize the fallacy of their ways. Hopefully, McCain will be able to get the message out on the drastic difference between him and Obama on health care, the economy, and the military. Sadly, here’s a YouTube video of a typical starry eyed Obama supporter, saying “I won’t have to worry about putting gas in my car. I won’t have to worry about paying my mortgage. If I help him, he’s gonna help me.” Just what does she think Obama will do? Give her free money, free health care, free gas? The money has to come from somewhere. What slippery slope towards socialism are we being led down? This entry was posted in General, Interesting, Politics and tagged election, McCain, obama, Politics, socialism on November 2, 2008 by Scott. It looks more and more like Joe the Plumber was on to something about taxes, though you wouldn’t know if from most of the polls and media. The Heritage Foundation has the details in our new study: If a President McCain got his way on tax reform, Americans could expect to see jobs, the economy and their own disposable income grow much faster than if a President Obama were to push through his proposals. SENATOR OBAMA: Well, that might happen or it might not. It depends on what’s happening on Wall Street and how business is going. This entry was posted in General, Politics and tagged government, McCain, obama, Politics, taxes on October 26, 2008 by Scott. Wow! What a horrible idea. With less incentive to work hard, this equality would drop to the least common denominator and the economy would crumble. Kind of like Obama’s idea of taxing the profitable companies that support this country and distributing the wealth to the people that don’t even pay taxes. This isn’t even a tax cut for them but simply a handout by redistribution. Joe explained that he works for a small plumbing and heating company. He’s been thinking about maybe taking over the business when his boss retires. Problem is, that would make Joe one of millions of small business owners who face a sudden increase in taxes under my opponent’s tax plan. That didn’t seem fair to Joe. He wanted to know why Barack Obama plans to raise taxes on folks who are trying to start or grow a business and create jobs for others. And fairness aside, at a time of serious economic crisis, punishing job creators didn’t seem like a real good way to kick-start a recovery. This would also explain some big problems with my opponent’s claim that he will cut income taxes for 95 percent of Americans. You might ask: How do you cut income taxes for 95 percent of Americans, when more than 40 percent pay no income taxes right now? How do you reduce the number zero? Well, that’s the key to Barack Obama’s whole plan: Since you can’t reduce taxes on those who pay zero, the government will write them all checks called a tax credit. And the Treasury will cover those checks by taxing other people, including a lot of folks just like Joe. 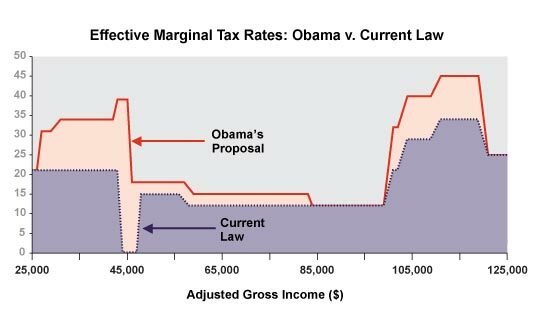 In other words, Barack Obama’s tax plan would convert the IRS into a giant welfare agency, redistributing massive amounts of wealth at the direction of politicians in Washington. I suppose when you’ve voted against lowering taxes 94 times, as Senator Obama has done, a new definition of the term “tax credit” comes in handy. At least in Europe, the Socialist leaders who so admire my opponent are upfront about their objectives. They use real numbers and honest language. And we should demand equal candor from Senator Obama. Raising taxes on some in order to give checks to others is not a tax cut it’s just another government giveaway. What’s more, the Obama tax increase would come at the worst possible time for America, and especially for small businesses like the one Joe dreams of owning. Small businesses provide 16 million jobs in America. And a sudden tax hike will kill those jobs at a time when need to be creating more jobs. Fortunately, America has an alternative to the phony tax cut my opponent started talking about only months ago. The McCain-Palin tax cut is the real thing. Among our other serious tax reforms, we’re going to reduce every income tax bill in America, and double the child deduction for every family. We will cut the capital gains tax. And we will cut business taxes to help create jobs, and keep American businesses in America. This entry was posted in General, Interesting, Politics and tagged capitalism, McCain, obama, Politics, socialism, taxes on October 21, 2008 by Scott. … Brooke, who lives in Denver, is 24 and works in a local arts program. Dave, 23, lives in Connecticut, and isn’t doing a lot now. “I was recently working in an organic lettuce farm in Hawaii, and after that I was a camp counselor, and I’m currently unemployed,” he tells me. Nouri, 22, lives in New York and works for a documentary filmmaker — he’s here tonight as part of a project “making movies about protests and questioning the validity of both the convention and protesting and trying to find a place in that dynamic.” The three of them met when they were students at Wesleyan. They all admire Obama and very much want him to become president. If that happens, I ask, what would they like to see him do? “Rally them to do anything in particular?” I ask. I ask about John McCain. Is this who you want determining the future of America? Could these young adults actually debate any of the issues? Do they know what “change” Obama is promising? Or, are they just part of the celebrity cult of Obama? This entry was posted in Funny, General, Interesting, Politics and tagged election, McCain, obama, Politics on September 3, 2008 by Scott. I’m glad that the Republican party seems to be returning to its roots of small government. The speeches tonight by Romney, Huckabee, and Giuliani all alluded to that fact. This entry was posted in General, Politics and tagged election, government, McCain, Politics on September 3, 2008 by Scott. “Today, news reports indicate that Russian military forces crossed an internationally-recognized border into the sovereign territory of Georgia. Russia should immediately and unconditionally cease its military operations and withdraw all forces from sovereign Georgian territory. What is most critical now is to avoid further confrontation between Russian and Georgian military forces. The consequences for Euro-Atlantic stability and security are grave. Chicago, IL — “Over the last several weeks, Russia and Georgia have been engaged in a steadily more dangerous confrontation over two secessionist regions of Georgia — South Ossetia and Abkhazia. Although these territories are located within Georgia’s internationally-recognized borders, the Russian government seems determined to challenge Georgia’s territorial integrity in both places. Developments took an especially provocative turn several days ago when four Russian warplanes violated Georgian airspace close to the Georgian capital for forty minutes. All parties — Russia first and foremost — must now reduce tensions, avoid the risks of war, and reengage in peaceful negotiations. As I stated in April of this year, I am committed to upholding the sovereignty and territorial integrity of Georgia. This commitment has long been a fundamental building block of U.S. policy, and it will not change under an Obama Administration. I also affirm Georgia’s right to pursue NATO membership. This aspiration in no way threatens the legitimate defense interests of Georgia’s neighbors. This entry was posted in General, Politics, World and tagged election, McCain, obama, Politics on August 10, 2008 by Scott.